- Measuring 1000 x 800 mm, blade thickness of 2 mm, with a desk thickness of 3/8 x 450 x 900 mm, hardened with 3/8 ribbings. 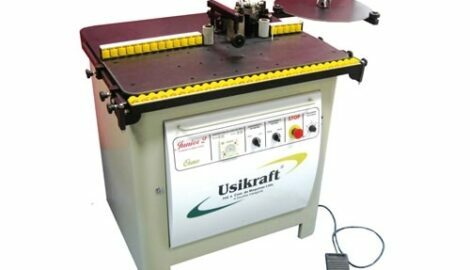 - Machine for gluing paper, wooden blade, formic, ABS and PVC. - Aluminum Support with nylon pulleys helps with the panel conduction, easing up its alignment. - For paper, wooden blade, PVC or ABS, materials in reels, maximum thickness of 3 mm. - For activation of the inching knife and edging in round pieces. - Helps when pressing and it increases the desk course in 700 mm, also serving as a support for greater pieces. - Helps when pressing big pieces eliminating gluing oscillation. - Modifies the work speed from 4 to 12 m/min, adjusting according to the panel or operator’s practice.